Ohhh do I have a good one for you this week. 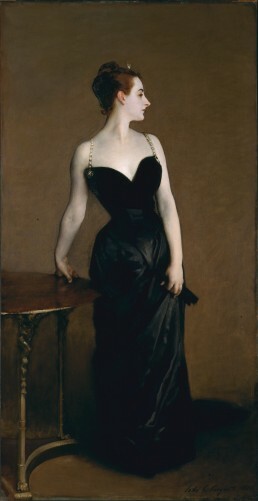 This bold and scandalous picture is titled Madame X due to the fact that the woman who modelled for it was so scandalised by the artwork that she insisted that John Singer Sargent remove her name from all associations with it. However, this once-scorned picture is now one of the most revered pictures and has a prominent position at The Met in New York. So what makes this picture so scandalous?… well, let me tell you a story. 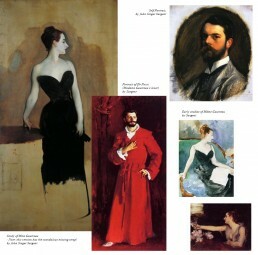 John Singer Sargent was an American artist but he had spent a lot of his life in Paris. He was determined to become the premier Portrait painter of the time. He had had some recent success but needed one high profile project to catapult him to the next level of fame. It was around this time that he was doing a portrait of a man called Dr. Pozzi – Dr Pozzi, just happened to be carrying on a very illicit and well-known affair with a lady called Madame Gautreau. Madame Virginie Amélie Gautreau was well-known in Paris for being the “It” girl at the time. She was young, vibrant and married to a man 20+ years her senior and she somehow managed to get away with all sorts of scandalous things. She was most known for her pale pale skin, copper hair, striking nose and swan-like neck that she delicately showed off in clothing that accentuated her curvaceous figure and bucked the traditions of the time. Mdme Gautreau was graceful and seductive. She reportedly spent a great deal of time on her appearance and went so far as tinting her skin white with lavender chalk to achieve an almost cadaverous paleness which she then accentuated by applying rouge to her ears, lips, cheeks and tinted her eyebrows with a mahogany pencil to achieve her signature look. John Singer Sargent, along with many of the famous artists of the time, was desperate to paint her – this was the exact type of person that could make him as an artist. So he begged Dr Pozzi to refer him to Madame Gautreau. Dr Pozzi eventually did and Sargent received the long-awaited invitation to join the Gautreau’s at their country estate where he began the first of many sketches of his new muse. It was decided that Sargent would produce a portrait of Madam Gautreau that he would submit to the Salon for their prestigious show that year. Both artist and sitter were gleeful at the thought of the fame that would come to them after the portrait was well-received from the Salon and Parisian society. (Side note: The Salon could basically make or break artists. Artists clamoured to be accepted into the show and to be given prime place in the placement of their art). 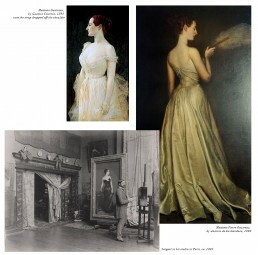 It took Sargent a year to create the piece – with many issues in-between – it seems that Madame Gautreau had the attention span of a gnat which made painting her impossible. What had once started as an infatuation quickly turned to frustration but eventually, Sargent finished the piece– and everyone who saw it, including Madame Gautreau, claimed it would be a huge success. Well, it wasn’t. Paris was scandalised. An interesting point to note – at the time the painting was shown in the Salon and in its original state – Sargent had painted the strap of her dress as falling off her right shoulder, giving her even more of a seductive air. He made the decision to paint the strap back on her shoulder hoping to quell some of the gossip surrounding the painting but nothing seemed to be able to rescue this painting from the notoriety it had already attracted. Madame Gautreau’s reputation was tarnished forever. She begged to have the painting removed from the Salon but it was refused. She eventually had to flee Paris and went into hiding until the scandal blew over. Although she tried, she never quite got her “It” girl status back and while she did eventually commission other portraits (including another one that featured a falling strap) none quite created the praise of her beauty that she desired. By the end of her life, she was a virtual recluse and she died in Paris, quite forgotten, in 1915. In 1916, a year after Madame Gautreau’s death, John Singer Sargent finally sold the painting to The Met for $1000. Sargent made a point of making it a condition of sale that The Met disguise the sitter’s name – which is how it received its title “Madame X”. While the controversy surrounding the painting never quite left Sargent, he did create a good career as a portrait painter and is now recognised as one of America’s finest painters of the time. Nothing he has done has quite held up against Madame X’s portrait in my eyes though. Full disclosure – I absolutely adore this painting! Hi, Im Johanna. A digital designer & artist located on the South Coast of NSW in Australia. Im slightly obsessed with art, fashion, old books, and summer.